Yesterday I experienced something as a book blogger that I wanted to talk with others in the community about... A spoiler was posted in the comments of a book review of mine. All in all I think of my blog as spoiler free. I never deliberately share any book spoilers here, and if I do think something could be deemed as a spoiler, I clearly state beforehand. Being someone who largely likes to go into books with a clear mind of what is to come, I know how frustrating stumbling upon a spoiler can be. I don't like to find spoilers elsewhere online, and for that reason I deliberately don't share them either. Prior to this occasion, I'd never come across someone sharing spoilers in the comment section of my blog before, so when I did see the comment I wasn't quite sure what to do... Ultimately, I deleted the comment. I don't like to delete comments. I delete spam. Of course. And I also delete comments if something has been shared multiple times by accident; it happens. 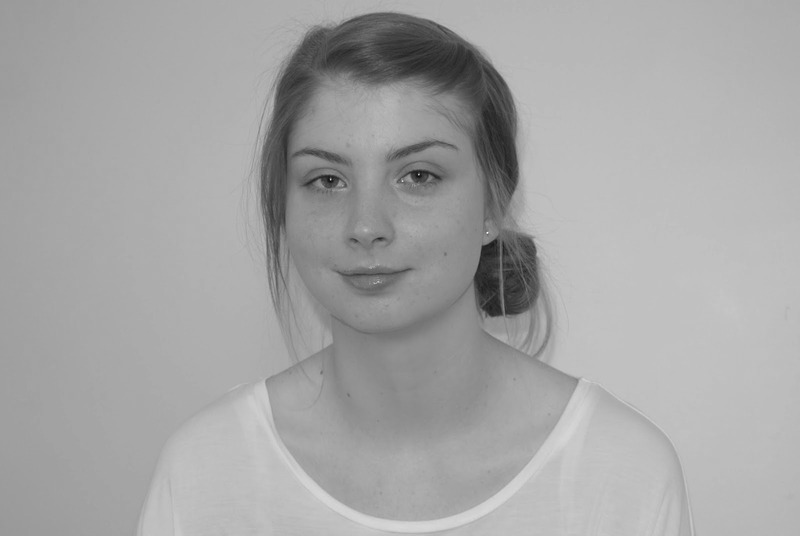 I'm open to the opinions and voice of others, even when they differ from my own. I'm very much open to conversation here on Reading With Jade; in fact the social side of book blogging is one of my favourite things within this community. In this instance though, I felt like I had no choice but to remove the comment. This incident isn't a massive deal, trust me I'm very much aware of that... But I think what bothered me most about the comment was the fact that the spoilers (yes, there were more than one) were written on a review post where I had specifically stated about keeping my blog spoiler free and so for that reason I had been vague about the plot. Such a small thing, but it really did bother me. The point of this post wasn't for me to rant or vent however... 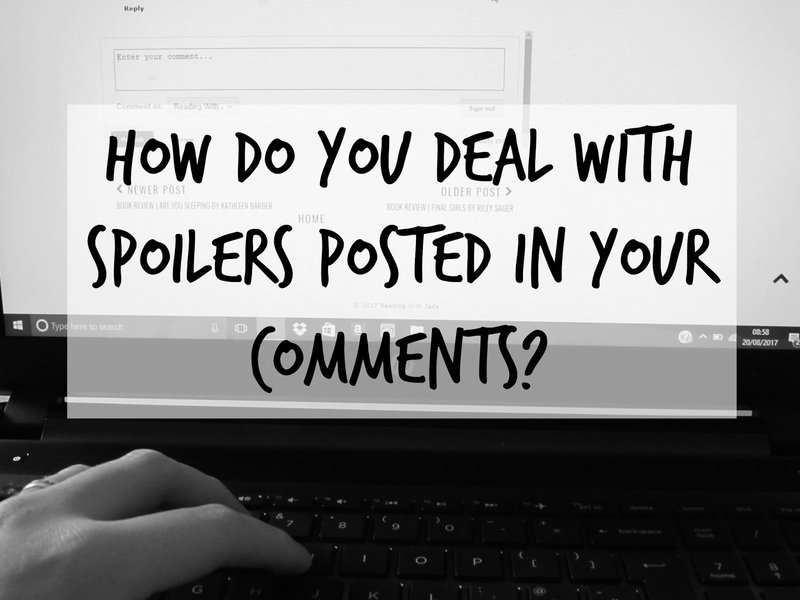 I wanted to put a question to other book bloggers: how do you deal with spoilers in the comments section? I don’t think that’s ever happened to me. People on my blog have been really good about not spoiling things. I probably would have deleted the comment, too. Spoiling books isn’t cool. I don't think I've experienced this either! But I think it's definitely fine to delete the comment if that happens. I've occasionally blogged a post with spoilers but am careful to state it up front. If people talk spoilers in a post like that, I think everyone knows what they're getting into! I think so long as spoilers are addressed within the post, then including them is totally okay! I don't think this has happened to me yet. I think I would do what you did though. I try to be spoiler free as well unless very clearly stated. I hate spoilers myself! When spoilers are stated I think that's okay, but I don't want them to sneak up on me! That's a tough one. I'd probably delete the comment as well, just to be on the safe side. That seems to be the general consensus. Thank you for removing it. :) I probably would have done the same thing, but as a reader, I appreciate spoiler free zones. I rarely post reviews anymore, so I haven't run across this problem yet. :) Blogger needs to design a "hide this comment" button or something! Sounds like you did the right thing by deleting the post! If you're not including spoilers in the review, they shouldn't be in the comments either. If the commenter is someone who's visited before or who might have other interesting things to add, it might be worth trying to reach out to the person to explain why you deleted the comment and inviting them to add spoiler-free thoughts. I've found that people usually put in a spoiler alert header :-) Most people are quite considerate about it! When posting a spoiler in the comments section of a post? I've never seen that myself, but definitely considerate!